A. A. Milne is a name that’s familiar to almost anyone who is now, or has ever been, a kid. For the few who might not know, Milne was the creator of Winnie-the-Pooh, that honey-loving bear who’s been a beloved childhood companion since 1925. January 18 marks the anniversary of his 1882 birth, and January 31 that of his 1956 death; in short, January is a timely month to visit the Hundred Acre Wood. Milne was already an established writer when he came up with Winnie-the-Pooh; he had written dozens of plays, novels, screenplays and essays, most of them works for adults. His work was popular and well-received, but none of that prepared him for the wild popularity of his children’s stories. Winnie-the-Pooh was born not long after Milne’s son, Christopher Robin. 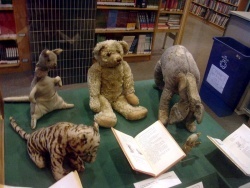 Many of the characters from the stories – including Pooh himself – were inspired by the young boy’s stuffed toys, while Pooh’s human friend, Christopher Robin, was inspired by Milne’s son. Tigger, Eeyore, Piglet, Kanga and Roo, all started life in Christopher Robin Milne’s nursery. Those characters all had pretty easily explained names, but for anyone who has ever wondered where Winnie got his name and what exactly makes him a Pooh, there is an answer. Winnie was a Canadian black bear featured at the London Zoo. Young Christopher Robin was a frequent zoo visitor, and he became such a big fan of the real-life Winnie that he was allowed to go into her cage, feed her and cuddle her. Luckily, Winnie was apparently an equally big fan of Christopher Robin. As for Pooh, that part of the name came from a swan. There’s disagreement all these years later over whether the swan was a family pet, or one they saw while on vacation, or just another of Christopher Robin’s stuffed toys. What’s certain is that there was a swan named Pooh, and when Christopher Robin was asked to give Edward Bear an exciting name, he came up with Winnie-the-Pooh. It might not make a whole lot of sense, but being sensical has never been a requirement of children’s literature. 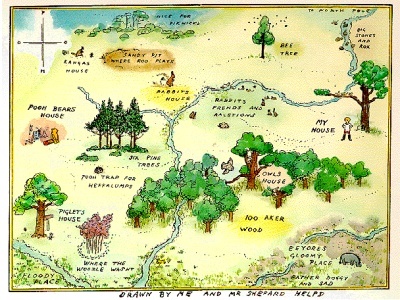 The Hundred Acre Wood, home to Pooh and his animal friends and frequent destination of Christopher Robin, was based on Ashdown Forest in East Sussex, England. Only a mile from the Milne home, Ashdown Forest was a favorite family destination for hikes to hunt for herbs or count pine trees on the hill Gill’s Lap (renamed Galleon’s Leap in the books). The original illustrator of the books, E.H. Shepard, visited Ashdown Forest for inspiration and, in some cases, drew true-to-life renderings of views there. It’s unknown whether Shepard played Poohsticks while visiting Ashdown Forest, but A.A. and Christopher Robin Milne certainly did. Their game of dropping a stick in a stream from a bridge, then rushing to the other side to see whose stick would emerge first (rendering him victorious), was immortalized in The House on Pooh Corner. In the years since the book’s publication, it’s become common for visitors to Ashdown Forest – including tourists from all over the world – to stop on the bridge for a few moments to play a game of Poohsticks. There’s even an annual World Poohsticks Championship held on the Thames in Oxfordshire. One of the more inclusive international sporting competitions, it boasts past winners as young as four years old. Winnie-the-Pooh was first featured in a Christmas story published in London’s The Evening News newspaper on December 24, 1925. The same story reappeared as the first chapter of the book Winnie-the-Pooh, a collection of stories about Pooh and his friends published the following year. It was followed by several Pooh poems in Now We Are Six in 1927 and another story collection, The House at Pooh Corner, in 1928. And that’s it for the original Pooh canon. Others have picked up the torch, and new stories and adaptations have appeared since 1928, but Milne himself was responsible for only these few slim volumes. 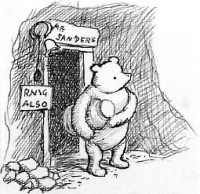 In a move that was nearly unheard of at the time, Stephen Slesinger purchased merchandising, television, recording and other trade rights to Winnie-the-Pooh from Milne in 1930. It was the birth of licensing, and Slesinger did it right – he turned Winnie-the-Pooh into a $50 million-a-year business by 1931. After Slesinger’s death, Disney acquired Pooh rights, and the modern Disney-style Pooh was born, with a series of feature films and featurettes. It was a move that led to even greater fame for Winnie the Pooh (as he’s known in the Disney films: no hyphens)… and it also led to the enduring battle between fans of classic Pooh and fans of Disney Pooh. Classic Pooh devotees might think they’re the ones who best honor the memories of A.A. and Christopher Robin Milne. In fact, it may not have mattered to either man which Pooh you prefer – they both regretted the great fame of the Pooh tales and wished the stories weren’t so inextricably linked to their names. Christopher Robin found himself pushed into the spotlight without his consent and forever known as a little boy who loved his teddy bear – not, perhaps, the image he wanted to cultivate as a grown man. And A.A. Milne wanted to go back to the variety and popularity of his previous writing – to write some adult works, maybe a play or a good detective novel – but fans just wanted more Pooh. He found it all a bit annoying. A.A. Milne wasn’t the first to learn that the characters you create can take on lives of their own, and he won’t be the last. Despite his wishes, 65 years after his death, his name still means “Winnie-the-Pooh” and little else. And the Pooh legacy endures, with a recent Disney film, Winnie the Pooh, from 2011. If he were here, Milne might not watch it… but his fans certainly will.